Europe has long been a leading destination for the world’s migrants. In recent years, the number of people migrating to Europe has increased dramatically, owing especially to ongoing conflict in the Middle East. In 2015 alone, more than 1 million asylum seekers applied for refugee status in the European Union. The majority of these asylum seekers arrived from predominantly Muslim societies – namely, Syria, Afghanistan and Iraq. Against this backdrop, attitudes toward Muslims and refugees loom large in the European political debate, and this is reflected in current public opinion. Majorities in Greece, Hungary, Italy and Poland express negative attitudes toward both Muslims and refugees. Even in countries with more positive views, such as Germany, Sweden and the Netherlands, at least half believe Muslims do not want to integrate into the larger society and majorities express concerns that refugees increase the chance of domestic terrorist attacks. In general, older people and less-educated individuals are more negative toward both Muslims and refugees. And in most countries, people on the right of the ideological spectrum are much more negative than those on the left. The survey asked respondents about their views of Muslims, Jews and Roma in their country. As has been the case in previous years, Roma receive the most negative ratings among the three groups asked about. In most countries, at least four-in-ten of the public say they have a very or somewhat unfavorable view of Roma. Negative attitudes are particularly widespread in Italy, Greece, Hungary and France. At the same time, relatively few Europeans give Jews a negative rating. No more than a quarter express unfavorable views of Jews in most countries. The major exception is Greece, where a 55% majority holds a negative opinion of Jews. Opinions of Muslims vary considerably across Europe. Half or more in Hungary, Italy, Poland, Greece and Spain have a very or somewhat unfavorable view of Muslims. And in Italy (36%), Hungary (35%) and Greece (32%), roughly a third hold very unfavorable opinions. Majorities in the other nations surveyed express positive attitudes about Muslims. Nonetheless, at least a quarter in each country have negative views of Muslims. In the past year, unfavorable opinions of Muslims have increased in the UK (+9 percentage points), Spain (+8) and Italy (+8). In Greece, negative views of Muslims are up 12 points since 2014, the last time the question was asked. In many countries, older people and those with less education are more negative toward Muslims. For example, 75% of those ages 50 and older in Greece have an unfavorable view of Muslims, compared with 53% of 18- to 34-year-olds. The age gaps are also large in Sweden (20 points), France (13 points), Italy (12 points), Spain (10 points) and the UK (8 points). In Spain, 54% of people with a secondary education or less rate Muslims negatively, while fewer of those with a postsecondary education (40%) do the same. Significant differences by level of education are also present in Sweden (23 points), the UK (17 points), the Netherlands (15 points), Greece (12 points) and France (11 points). The biggest divide in each country, however, tends to be political. 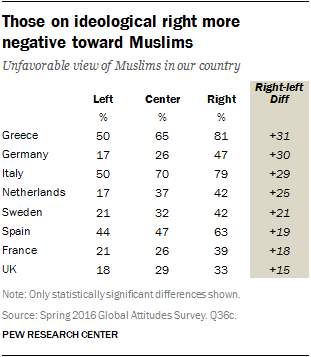 In Greece, 81% of people who place themselves on the right of the ideological scale have a negative opinion of Muslims, while 50% of people on the left say the same. There are also double-digit right-left divides in Germany (30 points), Italy (29 points), the Netherlands (25 points), Sweden (21 points), Spain (19 points), France (18 points) and the UK (15 points). This ideological divide translates to large partisan divides as well. In France, supporters of the anti-immigrant National Front (57%) are 32 percentage points more negative toward Muslims than those who identify with the Socialist Party (25%). A similar gap exists in the UK between supporters of the right-wing UK Independence Party (54% unfavorable) and Labour (22%) adherents. In both countries, supporters of the center-right parties hold views more similar to center-left partisans than to far-right partisans. Roughly three-in-ten supporters of the Republicans in France (31%) and Conservative Party backers in the UK (27%) say they have an unfavorable view of Muslims. In Sweden, 75% of those who are favorable toward the anti-immigrant Swedish Democrats are negative toward Muslims. Similarly, in Germany, 59% of people who express a favorable view of the anti-immigrant AfD hold a negative view of Muslims. At least half of the public in nine of the 10 countries surveyed say that most Muslims in their country want to be distinct from the larger society. This includes roughly two-thirds or more in Greece, Hungary and Spain. In general, older people and less-educated individuals are more likely to say Muslims want to be distinct. In addition, many people who are religiously affiliated are more skeptical about Muslims’ desire to integrate than those who do not identify with a particular religion. In France, 60% of Catholics say Muslims in their country want to be distinct, compared with 48% among those who are unaffiliated. There are also double-digit gaps on this question between those affiliated with the dominant religious groups1 in their country and the unaffiliated in the UK (19 percentage points), the Netherlands (15 points) and Germany (11 points). People on the right of the ideological spectrum are much more skeptical that Muslims want to integrate into the larger society than those on the left. Nearly two-thirds of right-leaning Britons (65%) say Muslims want to be distinct, compared with just 32% of those on the left. There are also double-digit ideological divides in Germany (33 points), France (28 points), the Netherlands (23 points), Sweden (23 points), Spain (14 points) and Italy (14 points). In terms of partisan differences, 80% of UKIP supporters say Muslims want to be separate from the larger society in the UK, while just 40% of Labour identifiers agree. In France, 76% of National Front partisans say Muslims want to be distinct compared with 42% of Socialist Party supporters. Views on the integration of Muslims have changed over time in some of the countries polled. Since 2005, when the question was first asked, the percentage saying Muslims want to adopt national customs has increased by 23 percentage points in Germany, 12 points in the UK, 11 points in the Netherlands and 7 points in France. 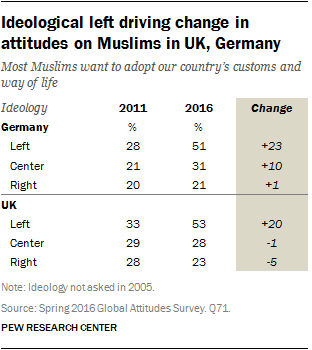 In Germany and the UK, the change over time is driven mostly by people on the left of the ideological divide. Since 2011, the overall percentage of Germans saying Muslims want to adopt their country’s customs increased by 9 percentage points. Among left-leaning Germans, the rise was 23 percentage points, from 28% in 2011 to 51% today. In the UK, the overall change since 2011 was small (+3 percentage points saying adopt customs). Among people on the left, however, the percentage saying Muslims want to integrate with the larger society increased from 33% in 2011 to 53% in the current survey. When asked specifically about support among Muslims for extremist groups like ISIS, few among the European publics surveyed think such sympathies are widespread. Nonetheless, in no country does a majority say “very few” Muslims support ISIS. And in five countries, a quarter or more say many or most Muslims do so. This includes 46% in Italy, 37% in Hungary, 35% in Poland, 30% in Greece and 25% in Spain. Large percentages of Poles (28%) and Hungarians (20%) do not express an opinion on this question. In countries such as France and the UK where fewer people believe that most or many Muslims in their nation support extremists groups, the political divisions are stark. A third of National Front supporters in France think a significant portion of Muslims in their country sympathize with groups like ISIS, compared with 15% of Socialist Party identifiers. About four-in-ten UKIP partisans (41%) express the same concern about Muslims versus just 10% of Labour supporters. Overall, Europeans are sharply divided on whether refugees leaving countries such as Iraq and Syria are a major threat to their country. Majorities in Poland, Greece, Hungary and Italy express this view as do 52% in the UK. Elsewhere, concern is much lower. Nonetheless, it is clear that attitudes toward Muslims and refugees are closely linked in public opinion. In all 10 countries surveyed, people who have a more negative view of Muslims are also much more concerned about the threat of refugees. For example, in Sweden, 50% of those who have an unfavorable opinion of Muslims say refugees are a major threat to their country. Only 10% of Swedes who have a positive view of Muslims say the same. In the UK, where immigration was a key issue in the debate around the vote to leave the European Union, 80% of those who have negative opinions of Muslims express concern about refugees compared with 40% among those who are favorable toward Muslims. Elsewhere, the attitudinal gap is at least 20 points. When it comes to defining the specific threat from refugees, Europeans perceive the possibility of domestic terrorism and a negative economic impact as bigger concerns than crime. At least half of the public in eight of the 10 countries surveyed say they believe that refugees will increase the likelihood of terrorism in their country. Concern about terrorist attacks is highest in Hungary and Poland, though clear majorities say the same in the Netherlands, Germany, Italy, Sweden and Greece. In the UK, 52% worry about the possibility of more acts of terrorism. The French and Spanish are the only two publics where concern about terrorism is somewhat lower, with at least half of these publics taking the opposite view that refugees will not increase the chance of domestic terrorist attacks. This is especially notable in the case of France, which experienced two high-profile attacks in January and November of 2015, for which ISIS claimed responsibility. People on the right of the ideological spectrum are particularly concerned about refugees and terrorism. Double-digit gaps between people on the right and the left of the ideological scale are present on this question in all countries except Poland. The right-left gap is largest in the UK (35 percentage points), France (34 points), Italy (32 points) and Spain (32 points). Similarly, the partisan divide on worries about terrorism is wide. For example, 87% of UKIP supporters believe refugees increase the likelihood of domestic terrorist attacks, compared with 39% of Labour partisans. In France, 85% of National Front identifiers are worried about a possible link between refugees and terrorism, while just 31% of Socialist Party supporters say the same. Broad majorities in Hungary, Poland, Greece and Italy say refugees are a burden on the country because they take people’s jobs and social benefits. Roughly half in France agree. The British and Dutch are split over the economic threat posed by refugees. Nearly equal percentages say refugees are a burden as say their work and talents make the nation stronger. Swedes and Germans, meanwhile, are much more positive on the economic impact of refugees. Roughly six-in-ten in Sweden (62%) and Germany (59%) believe that refugees’ economic contributions make their country stronger. The Spanish also lean more positive than negative on this question. Lower-educated people are much more concerned about the economic impact of refugees. In the UK, 56% of those with a secondary education or less say refugees will be an economic burden, compared with 23% of more highly educated Britons. The educational divide is also large in the Netherlands (28 points), Spain (26 points), France (19 points), Sweden (16 points), Greece (15 points), Italy (11 points) and Germany (11 points). Ideological gaps are wide on this topic as well, with right-leaning individuals more likely to have a negative view of refugees with respect to the economy. The difference between those on the right versus the left is 20 points or more in most countries. The political chasm is particularly deep in France, where 71% of people on the right say refugees are an economic burden compared with just 34% of those on the left. The partisan gap on this issue is also very large. In France, fully 90% of National Front supporters are worried about the economic impact of refugees, while just 36% of Socialist Party identifiers express concern. In the UK, 84% of UKIP supporters say the same, compared with 35% of Labour partisans. 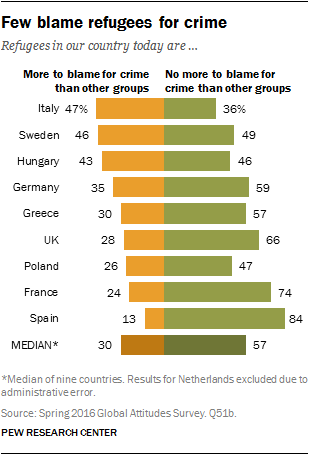 Finally, the threat of crime ranks much lower in Europeans’ concerns about refugees. Majorities or pluralities in most countries believe that refugees are no more to blame than other groups for crime in their nation. The exceptions are Sweden and Hungary, where the publics are divided, as well as Italy, where the prevailing view is that refugees are responsible for more crime than other people. As with other questions, the ideological and partisan divides are wide on this issue. Across all three threats – terrorism, the economy, and crime – people who hold unfavorable views of Muslims are much more worried about refugees’ impact on their country. For example, in the UK, 84% of people who give Muslims a negative rating also say that refugees will increase the likelihood of terrorism in their country. Just 39% of Britons with a favorable view of Muslims say the same. On the issue of refugees and terrorism, the gulf between people with positive and negative views of Muslims is wide in all 10 European countries surveyed. This pattern holds in nearly all countries for concerns about refugees’ economic impact and their effect on crime as well.